That's such a pretty yarn! My experience with The Fold is at Rhinebeck. I always make a point to visit the booth and buy some yarn. It is totally worth the line I've stood in each year. The buds have appeared on the forsythia here in Boston and the snow is all nasty and dirty. Spring must be on the way. Oh, that's pretty! The sky in a skein on a summer day. One can never have enough pale blue yarn. That is the answer! Why would we be in IL? Perhaps we live there. Well, I've never had STR yarn, though I've wanted to try it for a while. The Fold, you say? I am in Illinois so will search it out. Thanks for the info! Well the sun is shining and it's getting warmer, but it's hard to believe that Spring is coming to Boston anytime soon. Maybe making a little wrap instead of a big wooly thing will hurry it along. Blue is my color so I would love the opportunity to knit with this yarn. I wish I were seeing more signs of spring- got a lot of rain today... I fear that is as close to spring as we have gotten so far! 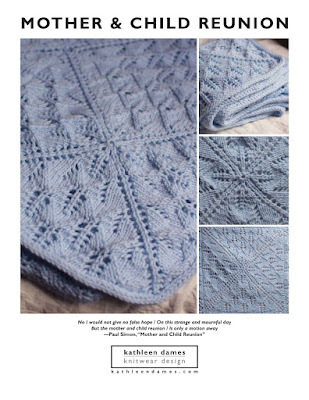 The she shawl and yarn! Oh, that yarn is so pretty! And as for signs of Spring, almost all the snow in our yard has melted. Yay! BEautiful yarn & pattern. Count me in! We're alternating between sunshine and snow here, but that's normal even during the winter. The best sign of spring so far is that I saw geese on the river the other day. Here in SF we have pretty blurry seaons. It's still sort of Wint-pring, the rains continue to fall. Soon the rains wil go away and it will be Spri-mer.